Powered by the sun, Uplift is a unique new spiralling sculpture, created by an award-winning designer to soothe the soul. After ordering a few of these beautiful spiralling solar sculptures for the Calm office, we admit to feeling a little star-struck when Tom agreed to sit down with us to talk about mindfulness, creativity, spirals and his latest artistic innovation. Here are a few highlights from our interview. Do you have a meditation and mindfulness background? If so, tell us a bit about it and how it influences your work/art. In the same way that creativity is something you nurture from within, so too is my relationship with mindfulness and meditation. I grew up in a wonderfully energetic environment so finding a little calm for myself was an essential part of my childhood. I have always been quite an empathetic person so from time to time I'd need to take a moment out to process my thoughts and emotions. From a young age I spent a lot of time on my own drawing or making things, sat up a walnut tree (my favourite place) and occasionally I would lie in an empty bath tub in darkness and bliss out to the white noise of an extractor fan. True. I'd have been about six years old and from what I have read about transcendental meditation, that's exactly what I was doing, albeit off my own back and with no guidance, but it felt good. I could see the whole universe behind my eyelids. So, no, I have no formal background in mindfulness, but at the same time, I have found my own unique way to process the vibrancy of life and I am an eternal daydreamer so I know well the power of my mind. I also grew up in a quiet village in rural Somerset, England, so I easily find peace and serenity within nature. But I admit, I find it very find difficult to turn off when I am in a city and can easily get over stimulated and it makes me hyper. Actually, that's an understatement, cities leave me buzzing like some sort of drug, which is possibly why I don't drink coffee either. Don't get me wrong - I love being in the city - but I find it real challenge to totally relax. Having been able to find peace within myself from a young age has allowed me to return to that source whenever I need inspiration. When I want to be original I never look outside of myself. I don't look at market trends and I don't follow fashions. I am not looking to be anything that I am not already. But that doesn't mean I am enlightened or always centred. Far from it. I don't live in a monastery and I have a young family and a small business, so life is a constant juggle. Modern life can be a challenge, maybe that's just part of getting older, but there are all sorts of traps that you can get yourself caught in - over thinking, distraction by technology, fears of failure, financial worries... the list goes on... so we all need coping mechanisms and they have to change as our lifestyles and behaviours change too. I have learned to be quite elastic in my mind and if I do take time for myself, to wander in nature, I tend to be able to return back to centre even if I get a bit lost, which happens. But allowing my thoughts to flow is essential to my professional function and FLOW is THE word. It's the opposite to a creative block and is the essence of all I strive to be. When I feel abundance it tingles in me and I feel my whole body lightens up - it's at this point, once in a while, that everything becomes clear and I know exactly what to do. In adult life, when I first lived in the city, running became my go to wonder drug to help shuffle the disorder of my mind. Running can be a meditation and it works too. But recently, inspired by injuries, I have been seeking alternative ways to encourage me to practice meditation at home, without the need to run eight miles just to find a little serenity. So I created Uplift, to inspire a non-thinking state of mind... I just love it. I let Uplift do the whirling and so my thoughts remain still. 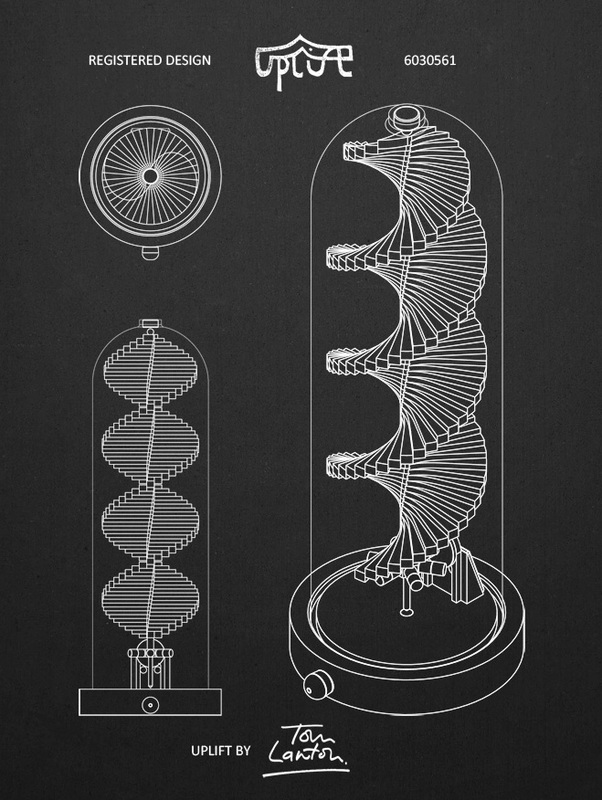 This isn't the first time a spiral has shown up in your work as an artist and an inventor. What meaning does the spiral have for you in your life? I’ve always been drawn to geometry. The simplicity of a circle. The strength and versatility of a triangle, the fixed order of a square — but most of all I love spirals. At every scale of nature they exist to unify physical laws and bring beauty to their worlds — whether being hauled on the back of a snail, sealed inside a rock, disappearing down your plug hole when you brush your teeth or exploding forwards like the helix nebula of a dying star. Spirals delight me and they hold a powerful, naturally occurring symbolism in my mind. Certainly when you picture depression or adverse negativity, it can be perceived as a downward spiral, so I have, for a long time, been meditating on a counter visualisation to that. To me, visualising an upward spiral is a powerful tool for lifting my own spirits. That's why you see it in my work. Can people use Uplift with Calm? If so, how would you recommend they use Uplift with Calm? Uplift and Calm are bosom buddies, both offering a soothing balm for weary souls but I use them very differently. When I am in the city, Calm is my go to App for mindfully taking time out and it helps me get to sleep. But when I am at home or in my studio Uplift has a pride of place because I simply don't want any more screen time and it's just beautiful - plus, usually my kids steal my phone as soon as I get home anyhow. But seriously, Calm on a smart phone is like a walkman - perfect for mediation on the go - but Uplift on my sitting room window sill is like coming home to a good stereo system with a classic LP playing - there is no comparison, but I am not going to take it with me on the train. Describe the place that you feel most calm in the world. I feel calm pretty much anywhere in the world if it's in the sweet half an hour after I have finished a run. I could be sat on a pavement, a public bench, by the river at home or just sat on a wall watching the world go by. I run for that moment, the moment when I stop and catch my breath. Otherwise, just being at home at the end of the day with my family, doing whatever they are doing, that's the best place, day dreaming as I look at Uplift, meditating on where this beautiful project might go next, that's a pretty special place too.